Inventory We are a resale marketplace, not a box office or venue. Ticket prices may exceed face value. This site is not owned by State Farm Arena . 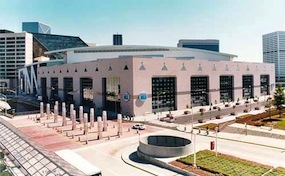 State Farm Arena is an indoor arena in Atlanta, Georgia. Completed in 1999, at a cost of $213.5 million, it is home to the Atlanta Thrashers, of the National Hockey League, the Atlanta Hawks, of the National Basketball Association and the Atlanta Dream, of the Women's National Basketball Association. It is owned and operated by Atlanta Spirit, LLC. State Farm Arena is one of the most popular concert venues in the country bringing past acts like Taylor Swift, Elton John, Ed Sheeran, Bruno Mars, and Bruce Springsteen. ArenaAtlanta.com is a privately owned and operated company that concentrates solely in the online resale of all tickets in the secondary market. We are not currently affiliated with any official website, venue, and or box office. Ticket prices on our sites may fluctuate well above or below face value and can change quickly with market conditions. To order tickets for all State Farm Arena Atlanta events please follow the steps online through the checkout or pick up your phone and dial our operators at anytime.